Boden Embellished Top . Made from cotton with a little added lycra, fitted shape and with two little slits either side of hem. The v neckline has a contrast satin fabric embellished with tiny beads. Lovely floral print shirt with contrast spot inner collar. Colour: Pink. Boden Ladies Women's semi fitted Blue PETITE Denim Shirt Top Long Sleeved. BODEN Ladies white shirt. UK size 10 Petite. WA727. Brand New With Tag. Brand new BODEN Ladies white shirt. UK size 10 Petite. WA727. Brand New with tag and packaging. Free postage and packing. Condition is Used. Neck to hem (back) 24". Good used condition. Waist (smallest part) 34". POLKA DOTS. PRETTY BLUE BROWN BLOUSE. I’m sure we can sort it directly. IN GOOD CONDITION. THIS IS A PRETTY BODEN ALFRESCO TOP SIZE 6 PETITE IT IS A MULTI-FLORAL COLOUR WITH CAP SLEEVES BUST IS 28"--30" AND THE LENGTH FROM THE SHOULDER IS 29". Double knit stretch cotton jersey. Back neck velvet tape. Round neck. Self-fabric neck binding. Long sleeve. 96% cotton, 4% elastane. SHORT SLEEVED SHIRT / TOP / BLOUSE. DECORATIVE COLLAR. Lovely decorative contrasting tape collar. Size :UK 8P = US 4P = EU 36P. Length from top of the shoulder to bottom hem: 22.5 " = 57cm. Front drop from the neck to the bottom hem: 19.5" = 50cm. Boden White Polka Dot Shirt. Size 8, petite. In good condition. One discreet, yellow mark to front, as pictured. 100% cotton. condition really nice looks new. BODEN BLUE & CREAM CLASSIC SHIRT. SIZE UK 12P. GREAT QUIRKY DESIGN. BODEN striped long sleeve Breton top size 10 (petite). White with a navy stripe. Condition is Used. Dispatched with Royal Mail 2nd Class signed for. Pale pink in colour with floral and spotty pattern. Lovely cotton classic shirt/blouse by Boden. Size 8 Petite. Bust 36", hip 38", length 23 ". Very comfortable soft material. Alfresco Tunic Top. condition new. 95% cotton & 5% elastane. 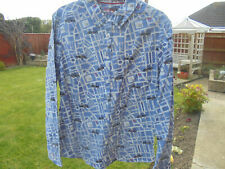 BODEN BLUE BIRD PRINTED CRISP COTTON SHIRT S/6 EXC LAUNDERED COND. BODEN BLUE BIRD PRINTED CRISP COTTON SHIRT S/6 EXC LAUNDERED COND.. PIT TO PIT 18” LENGTH 25” SLEEVE LENGTH SHOULDER TO CUFF 24” FROM PIT 18” Condition is great Used. Dispatched with Royal Mail 2nd Class signed. Floral pattern. 95% cotton & 5% elastane. condition NEW. Ladies BODEN Check Shirt Sz 10P Petite Pink Blue White Casual. Condition is Used. Label states a size 10P. Good used condition. Waist (smallest part) 34". A really beautiful BODEN 100% Linen kaftan top. Size 14 petite. Navy, primrose and white. The Classic Shirt from Boden in a wonderful multi-coloured tree pattern. Size 10 petite. 100% cotton. Machine washable. GORGEOUS BODEN CHECKED BLOUSE - SHIRT. SIZE 14 - 19" PIT TO PIT, 26" LENGTH, FITTED. DIFFERENT COLOURED COTTON ON EACH BUTTON. STRETCHY COTTON. VERY GOOD CONDITION. BODEN Top, Size UK 6, Beautiful Flattering Floral and Drapy. A gorgeous shirt with a leaf print. The material is lightweight and soft to the touch. The fabric is a nice weight not see through. All faults are clearly described. Our policy is to standardise as much as possible. This is a really pretty floral top with buttons down the front.The top is easy to wear and looks lovely. The material is lightweight and the material is very fine. The top has no stretch. All faults are clearly described. A lovely casual top with a scoop neck and long sleeves. It i s made from a light weight stretchy material. Our policy is to standardise as much as possible. The size on the label is a 10. All faults are clearly described. Neck banding. Stretch cotton jersey. Round neck. Contrast back neck tape. Long sleeve. Sleeveless Printed Tunic. Size: 10 Petite. Style Tunic. The length you choose will depend on your height and whether you want to wear flats or heels. Color: Blue / White. Sleeve Style Sleeveless. Materials: 100% Cotton. Sleeveless Printed Tunic. Size: 6 Petite. Style Tunic. The length you choose will depend on your height and whether you want to wear flats or heels. Color: Brown / White. Sleeve Style Sleeveless. Color Brown / White. Blossom Sleeveless Tunic w/ Left Side-Zip. Size: 2 Petite. Color: Multi / Pink. Style Tunic. The length you choose will depend on your height and whether you want to wear flats or heels. Sleeve Style Sleeveless. Blossom Sleeveless Tunic w/ Left Side-Zip. Size: 4 Petite. Box Boden 7. Style Tunic. The length you choose will depend on your height and whether you want to wear flats or heels. Materials: 100% Cotton.